"The Matrix Revolutions" spun a bit slower at the box office as the sci-fi saga's conclusion had an opening domestic weekend of $50.16 million, off 45 percent from the middle chapter's $91.8 million debut six months ago. Pummeled by critics as harshly as "The Matrix Reloaded" was last May, "Revolutions" has grossed $85.5 million since debuting Wednesday, according to studio estimates Sunday. That was down from the $134.2 million that "Reloaded" - which opened on a Thursday - took in over its first four days. While domestic audiences dwindled, distributor Warner Bros. focused on the worldwide results for "Matrix Revolutions." Warner opened the movie simultaneously in a record 109 countries, where it racked up a worldwide total of $204.1 million in five days, beating the previous global high of about $200 million for "The Lord of the Rings: The Two Towers." Will Ferrell's Christmas comedy "Elf," about a human raised among the little people at the North Pole, opened strongly in second place with $32.1 million domestically. In narrower release, the romantic comedy "Love Actually" had a healthy debut of $6.6 million, coming in at No. 6. Added to the $737 million worldwide that "Matrix Reloaded" rang up, the franchise this year already is pushing the $1 billion mark. "Anytime you have a billion dollars in box office, that's pretty impressive," Joel Silver, producer of "The Matrix" franchise, said Sunday. "I don't know how you point a finger and say there's anything wrong there." Still, interest clearly has waned in the franchise, which began in 1999 with the Wachowski brothers' "The Matrix," starring Keanu Reeves, Laurence Fishburne and Carrie-Anne Moss. The movie's sleek black fashion sense and slow-motion visual effects have become one of the most copied looks in movie history. Many fans of the original were disappointed by "Matrix Reloaded," finding it a lackluster follow-up that emphasized style over substance. "Reloaded's" opening weekend - the second-best ever after "Spider-Man's" $114.8 million - was greatly due to pent-up demand since the original movie. "Revolutions" lacked that buildup. "I don't know what film could do $90 million and then repeat that with its next sequel just six months later," said Paul Dergarabedian, president of box-office tracker Exhibitor Relations. Playing in 3,502 theaters domestically, "Matrix Revolutions" averaged $14,322 a cinema from Friday to Sunday, down from a $25,472 average for "Matrix Reloaded." "Elf" averaged $9,619 in3,337 theaters, while "Love Actually," whose ensemble cast includes Hugh Grant, Emma Thompson, Liam Neeson and Laura Linney, averaged $11,458 in 576 cinemas. Dan Fellman, head of domestic distribution for Warner, said "Matrix Revolutions" may hold up better in subsequent weeks than did "Matrix Reloaded," whose grosses nosedived in its second weekend. Films tend to have longer shelf life over the holidays than they do in summer-blockbuster season, he said. "The story really isn't over yet," Fellman said. "We might not have had the same impact in the opening weekend, but you need to play this out for the next few weeks and see if we play a little catch-up." "Elf" and "Love Actually" were scheduled against "Matrix Revolutions" as alternatives to the sci-fi franchise, whose core audience is younger males. Families and children accounted for most of the crowds at "Elf," while "Love Actually" played mainly to women and older adults. "We assumed we would be swamped, and essentially, we did get swamped" by "Matrix Revolutions," said Russell Schwartz, head of domestic marketing for "Elf" distributor New Line. "We were not trying to be No. 1." 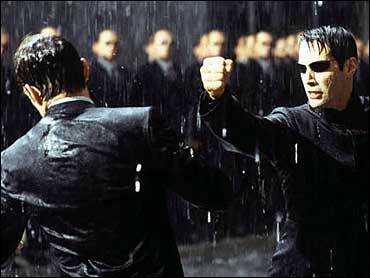 "The Matrix Revolutions," $50.16 million. "Scary Movie 3," $11.1 million. (tie). "Runaway Jury," $4.8 million. (tie). "The Texas Chainsaw Massacre," $4.8 million. "The School of Rock," $3.15 million.